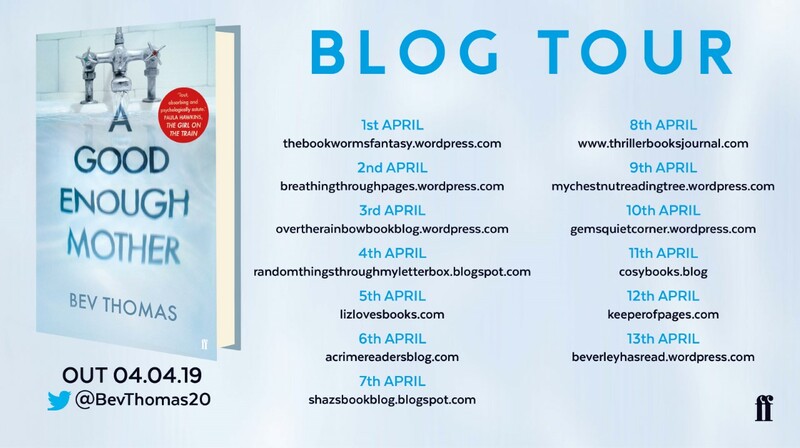 Bev Thomas’ debut novel, ‘A Good Enough Mother’, is due to be released on 4th April 2019. Thomas was a clinical psychologist in the NHS for many years, and she currently works as an organisational consultant in mental health and other services. She lives in London with her family. I really enjoyed the intrusive narrative style. The story is narrated from the first-person perspective of Dr Ruth Hartland, providing the reader with an in-depth insight to her thoughts, feelings and emotions. Some sections are narrated in the present tense, and some sections narrate Ruth’s recall of past events. Both narratives increase in suspense and tension, and finally come together at the end. There are many thriller elements incorporated in the novel, such as increasing tension and suspense, mystery surrounding what happened to Ruth’s son, plot twists and more. It’s definitely more of a slow-burning psychological thriller, and it does take a while to get going, so if you like psychological thrillers with a slower pace then you’ll really enjoy this book! The book motors onwards to a final shocking twist, which throws everything into turmoil. The novel addresses some difficult topics, such as mental illness, suicide, self-harm, death, grief, murder and more. It explores the therapist-client dynamic really well, and all the difficulties that come with being a therapist. This is a good read, and I urge all of you who enjoy psychological thrillers to read this, particularly if you are interested in reading a book about mental health and therapy!